While a targeted search for a specific memo based on attributes such as “Document name”, “Author”, “Creation date”, or “Memo title” is realized within the “Overview of memos”, the search for actual words or strings in the memos themselves is realized using the Lexical Search function – unless a standard search in the “Preview” column, which includes the first 63 characters of the memo, is sufficient. 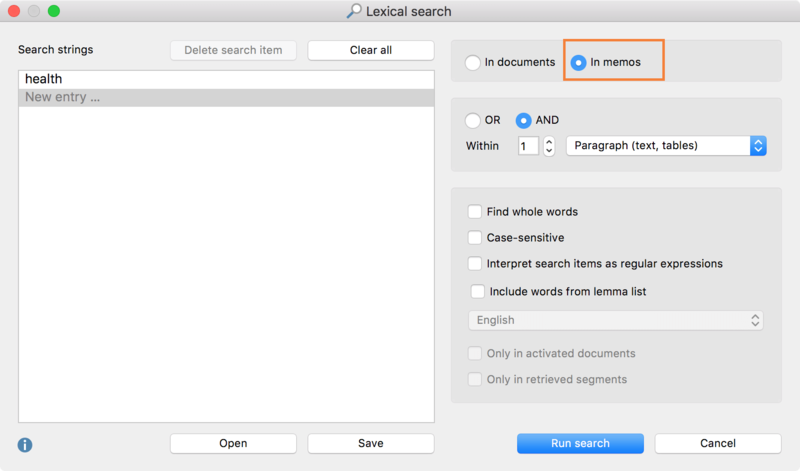 To search in the memo text, select Analysis > Lexical Search and enter the search word or words. If you want to search in the memos, you must specify In memos as the search criterion in the Lexical Search window; otherwise the search will take place in the documents themselves. The results are shown as a list of all memos that contain the search string in the memo text. This table can be worked with as described above. You can sort, jump to the document, edit the memos, etc. Tip: A single click in the results table will highlight the memo in MAXQDA and in case of an In-Document Memo the “Document Browser” will be scrolled to the memo icon. A double click will open the memo and highlight the search hit.